The Long Stone | Come Here To Me! ~ 837 – 1720 = The Long Stone, otherwise known as The Steyn(e) or Stein. ~ 1862 – 1959 = The Crampton Memorial. ~ 1986 – Present = The Long Stone replica. The old Viking ‘Long Stone’ was first constructed by Norsemen in 837 AD to symbolise their possession of the surrounding lands. The historic stone itself “escaped all the vicissitudes of time, the invasions of the Danes, the wars of Celts and Saxons, the struggles of Royalists and Republicans” (Ireland and the Celtic church, (1907) p. 281) but was eventually stolen in 1794. Does anyone know where it is now? 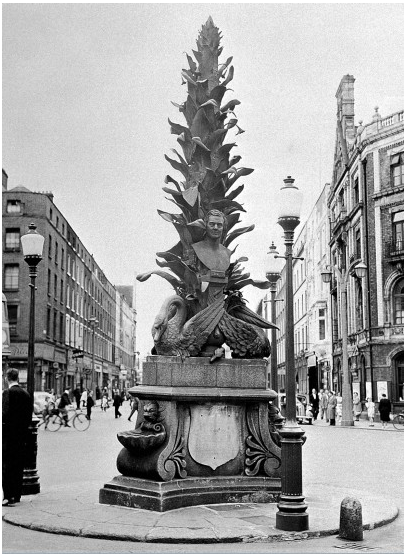 The Crampton Memorial, known colloquially as ‘The Water Baby’ and ‘The Cauliflower’, took its place and was situated at the junction of College St. with Pearse St. and D’Olier St. for nearly one hundred years. 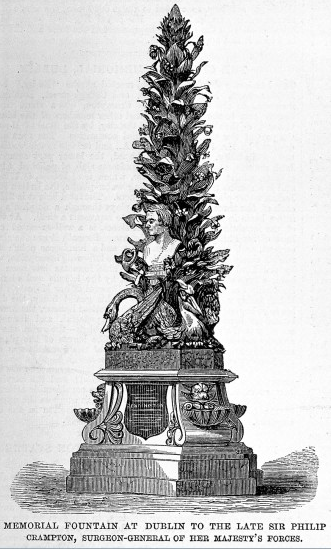 It was designed by John Kirk (son of Thomas Kirk (1781 – 1845)) and is named after Sir Philip Crampton (1777–1858), an eminent surgeon and anatomist. The memorial, which was made up of a stone base with three drinking fountains, slowly fell apart and was finally removed in 1959. In 1986, a replica of the Long Stone (designed by Cliodhna Cussen, mother of Aengus Ó Snodaigh and Rossa, Rónán, and Colm of Kíla) was erected. 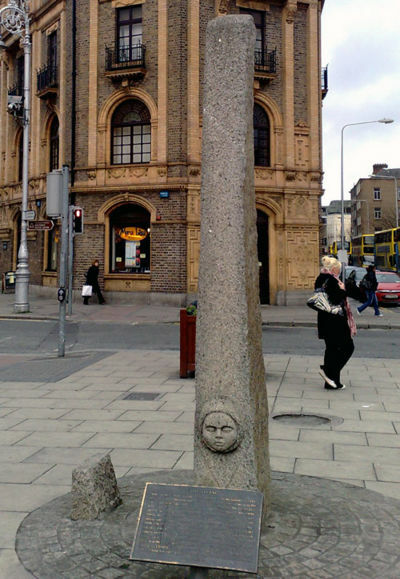 The 11 foot granite sculpture has the head of Ivar, the first Norse king of Dublin and who is believed to have erected the original Stein, on the base of one side and a head of a nun, from All Hallows monastery, which is thought to have been situated on the site in the Middle Ages, on the other. Having only remembered on Thursday previous it was my turn again to choose our route for Sunday, I hastily cobbled together a list of potentials, had a quick scout on the interweb and took a little time to whittle my list down to five. If only we could visit them all; give it time and we will have I guess. An interesting weekend it was turning out to be with the madcap encounter described by DMcHugh below on Friday evening, a great Punky Reggae Party in Seomra Spraoi later that night, a large slice of luck on Saturday afternoon (many thanks to Ringsend Rose;) and a beautiful Sunday afternoon. What better day for a walk around the city… Waiting at Molly Malone for the lads, I was witness to streams of tourists pause and giggle at Molly’s… ahem… appendages, funny photos to be taken back home and talked about, and no doubt the source of many profile pictures on Facebook and Bebo alike. I couldn’t believe it- a queue actually started to mount- I’d say if you stood there with a Polaroid camera and a sign saying “Photographs, €10” you’d be worth a fortune. Anyways, I’m losing the run of myself. A quiet start this week, just the three of us mainstays meeting for the start, to be joined later by Antrophe, DSmith and JFlood. So… first stop. 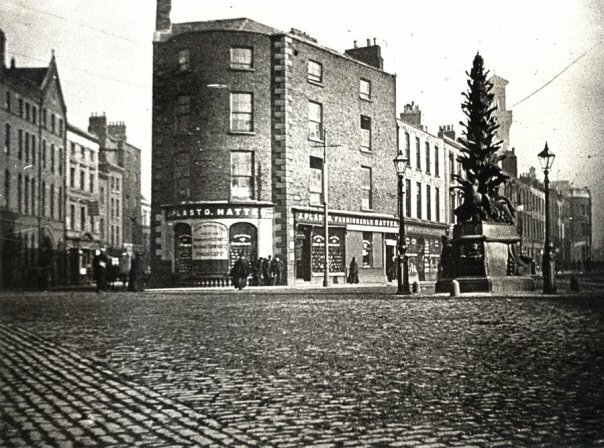 I had decided to cover old territory; Around Grafton Street, we had already stopped off, with varying degrees of success, in Nearys, McDaids, The Bailey, Kehoes and Davy Byrnes. One pub missing from this list, one we should have included before now but neglected, is of course The Duke, on Duke Street. 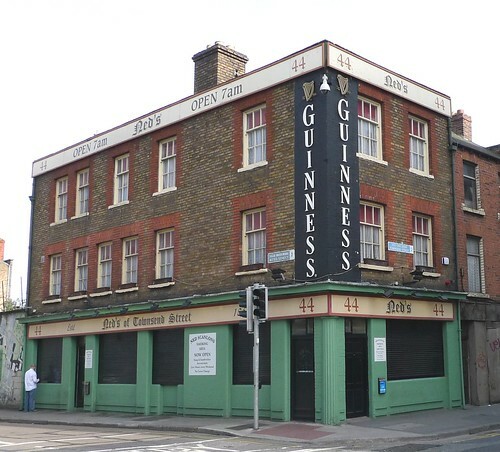 The outside of this pub belies a certain grandeur within; it really is a large premises that you can’t imagine ever being packed, what with the same floorspace in the upstairs bar as down. The end of the milk cup or tin cup final or whatever piece of silverware it was the Manchester Reds and the Birmigham Clarets were battling out for was on the big screen but the barman pointed out that there were a couple of quieter seats down the back or upstairs. (You might have noticed a theme of disdain towards the English Premier League in mine and DFallon’s posts, thats pretty much because we do hold it in disdain, and well, something akin to hatred, preferring to support teams actually on this island.) I didn’t do my duty and write the prices of the pints down in each place but if memory serves, pints here were €4.45 and very enjoyable indeed. A nice crowd in too but well dispersed, such is the lay out of the place. JayCarax led the way and we captured a nice quiet table near the back of the pub. Another venue for the pour your own pint initiative that seems to be popping up all over the place, you wonder if the characters historically connected with this place (It was, for a time, purported to be the favourite watering hole of Behan, O’Brien and other Dublin literary luminaries, and after that, Ronnie Drew and his cohorts) would take to such a thing, I can imagine them pouring and drinking the pints alright, its the paying for them that I’m not sure about. We didn’t linger too long, aware that the night had to end earlier than usual with JayCarax spinning the decks at the The Magnificent 7’s Session in 4 Dame Lane later that night. A nice place this, innocuous enough to be honest, historically important when it comes to Dublin social history but not much you can say after that; A fine pub, with fine pints and fine staff, certainly one that didn’t jump out as being outstanding having lost the characters of old but I don’t have a bad thing to say about it either. So we upped and headed out the door, to our next stop which was to be The Gingerman on Fenian Street. The Gingerman, which takes it’s name from the famous novel by JP Donleavy (a Mullingar resident now, strangely enough.) The first thing that hit us walking in the door was the smell, and that’s never a good thing- Close your eyes and you could well be in the Markievitz swimming pool down the road; bleach or chlorine or both… At least its an indication the place is clean I guess! I wasn’t over-awed by this place to be honest, nice and all as it was. None of us ventured a try at their home brew, all sticking to pints of plain at a relatively expensive €4.60. I guess the fact it’s attached to the Davenport Hotel drives the price up. DFallon was happy to see “real, actual books” on the shelves though, after his terrible let down out in the airport. The table opposite us was surrounded by young Trinners types sipping on “min-er-dils;” 7-ups and Fantas all around for some reason, maybe they didn’t trust the drink or were just the athletic type, who knows. Joined on this stop by JFlood, three became four and we headed off after another couple of mediocre pints. The next stop was probably the strangest of our stops so far on this run. Ned Scanlons (Or just plain and simple “Neds”) on Townsend Street is an institution in itself. They make absolutely no qualms about being a spit-and-sawdust local and rumour has it that it’s not long since they stopped spreading sawdust on the floor, having recently undergone “renovation” and adding quite a nice beer garden/ smoking area out the back. Now, it would be suicidal of me to criticize this place too much, as a few old friends and work-mates count it as their home-away-from-home but to say it’s “quaint” will do. You can’t give out, the pints ring in at €3.80 a pop. This was no student deal (You get the feeling students would be torn alive in here,) just one of the cheapest pints in Dublin. And a nice pint it was too, served by a jovial barman with his shirt hanging out at the back and looking like he had been indulging in the stock himself. I like this sort of pub, I’m not sure if the others do though. Going to the jacks is like heading into a dungeon, the womens was only added as an afterthought a couple of years ago, and the mens not far before that. Renowned as an early house, Neds is in the same tradition as Kennedys at Tara Street station and certainly one of a dying breed. As four became five, with Antrophe joining us, and inebriation setting in, we started on the short hop to our next stop, The Longstone down the other end of Townsend Street. I’ve already written a bit about this place below but I didn’t really go into it other than discuss the beautiful banners they have hanging on the walls. 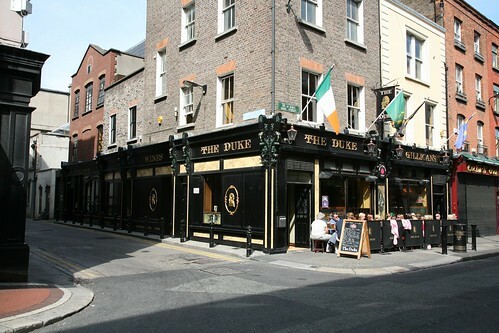 Aesthetically beautiful, this place and Davy Byrnes probably fight it out for the title of Dublins best looking pub. Although large and imposing, a lot of work has gone into ensuring that it remains authentic and doesn’t turn into a faceless beerhall. The front part of the pub is anonymous enough, small tables in areas squared off by the couches but when you get to the back of the pub… wow. This area is enclosed on three sides by a natural stone framed staircase on the left, a large landing area with quiet low tabling to the front and a narrow natural timber staircase to the right . We took up positon next to the ornate fireplace, said to represent Lugh, the norse god of light and heat… or something. We were joined here by DSmith, on his first venture along to the CHTM pubcrawl. As I said, I did a sizable piece on this pub below so don’t want to harp on about it. It’s beautiful to look at, I think pints were somewhere in the €4.60 range and weren’t too shabby. The banners I talked about below, obviously, inspired a great deal of conversation as again and little known facts and titbits of history started to flow and we lost ourselves, yet again. I’ve been here on a Friday evening before and it does tend to get busy, as do most Dublin pubs on Friday, an onslaughtg of office workers from all over the city who stagger from work to pub and merrily home. Merrily we left this place too, and after a brief run in with an Gardaí Siochána who demanded JayCarax list off what records were in his case before letting us go on our way (a truly comic… or tragic moment, a young man with a suitcase full of records; unheard of) muttering that it must be a quiet night on Dublin’s streets. Last stop, and new ground for us all- Bowes on Fleet Street. So, the end of the night was upon us, and a communal visit to Supermacs for their snack-box special and we we’re off. Another five pubs down, making it thirty four or so we’ve reviewed already, and many, many more to go.